We don’t repeat many desserts in this house. But these? These will be happening again. And, can I just say THANK YOU to the person who found a way to turn cake mix into a yeasty dough? Because, oh. my. gosh. You have changed my life. Seriously amazing stuff right here. I based this dough recipe off of the [oh-my-gorgeous] Red Velvet Cinnamon Rolls I found on no. 2 pencil, and it looks like she worked off of a recipe straight from Duncan Hines. I wasn’t sure the ooey-gooey-caramely-cinnamony monkey bread taste would really jive with the Red Velvet, but I’ll say it again: o-m-g-soooooooooo good! My doubts couldn’t have been more wrong– everything jived perfectly. Top it off with cream cheese frosting and chopped pecans, and voila! Classic Red Velvet all done up for breakfast. Fill a bowl or measuring cup with 2 1/2 cups warm (bath-like) water. I like to use a 4-cup measuring cup. Sprinkle the yeast over top and let rest. Meanwhile, mix together the cake mix, salt, and flour in the bowl of a stand mixer. Once the yeast has proofed (looks foamy), pour the yeast and water into the mixing bowl. Add the vanilla. Attach the dough hook, and mix on a low speed until dough forms (add more flour if a dough ball doesn't form). With floured hands, remove the dough from the bowl and spray non stick cooking spray generously inside the bowl. Also spray the top of the dough. Cover and let rise until doubled in size (I always set mine on a heating pad to rise, so it's done in about 30 minutes). While dough is rising, prepare the cinnamon sugar by mixing together the cinnamon and the granulated sugar in a gallon sized zip top bag. Set aside. Prepare the bundt pan by generously greasing and flouring the inside of the pan. Set aside. 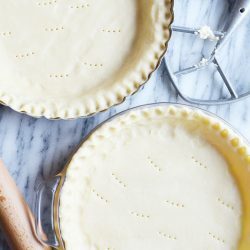 Once risen, punch down the dough and split it into two even portions. Cover one portion and set aside (either for another monkey bread, or to make an actual bread loaf-- like I did). Pinch of golf ball sized portions of the dough and place into the zip top bag filled with sugar (I did 4-5 balls at a time). Seal bag and shake until the dough is thorough coated. Place each dough ball into the prepared bundt pan. Continue with the rest of the dough. Bundt pan should be about halfway full. Cover and let rise in a warm place for about 20 minutes. Meanwhile, place the butter, brown sugar, and honey in a microwave safe bowl. Microwave for 1 minute (or until butter is melted) and whisk until combined. Pour evenly over top of the dough in the bundt pan. Bake at 400 degrees for 35-45 minutes or until a toothpick inserted into the dough comes out clean. Let cool for 10 minutes. Meanwhile, use a hand mixer to beat together the cream cheese, sugar, and vanilla until smooth. Gently push a rubber spatula down the sides of the bundt pan to loosen the dough from the sides of the pan. Invert the bread onto a plate. Spread the cream cheese frosting over top (or you can pipe it on like I did) and sprinkle on the chopped pecans. Serve warm! Yes, I know you usually use powdered sugar in cream cheese frosting. Just trust me here– after about 5 minutes, the frosting won’t have a grainy texture at all! If the bread breaks apart at all during the invert, simply patch it back together. Once the frosting is on, no one will be able to tell! This dough recipe makes TWO batches! I’m not very good at halving a cake mix, so I just went ahead and made the full recipe. I just placed the “extra” dough in a loaf pan and baked it as bread. Serve it with a little butter and cinnamon sugar on it for some very Valentine’s Day toast! I have a friend who can NOT get enough of Red Velvet. 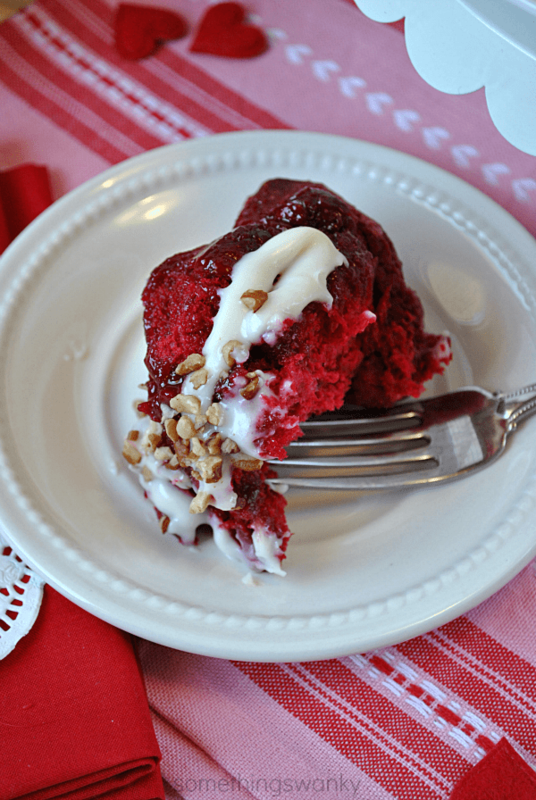 Red Velvet everything! She would love this! Thanks, Ashton! I love monkey bread and red velvet. This is a match made in heaven! I can’t wait to try this out. Yum! Seriously gorgeous!!!! Thanks so much for the shout out! sounds delish! I might give this a try this week for someones birthday at work. I have just one question. In reading the ingredients I find no mention of yeast. Under the red velvet cake mix you have listed 1 Tbpsn, is this for the yeast? Yes! It’s for the yeast! Sorry, I just fixed it! Don’t see how much yeast to use unless it is the 1Tbsp ingredient that us unspesified. Fixed it :) Yes, it’s the 1 tbsp. In the for dough section you have 1 tablespoon of ? I am guessing yeast but want to make sure! 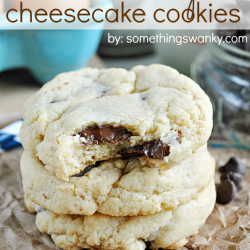 I looks so devine and I can’t wait to make it! Yes! Yeast :) I just went and fixed it. Morning!!! How much yeast do you need?? I have NEVER worked with yeast, and it kinda scares me….. This is absolutely the most beautiful monkey bread! The picture is stunning! That is seriously one gorgeous monkey bread! Wow, the color is intoxicating! 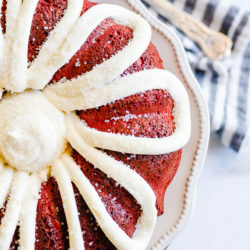 Ha ha, I can’t believe you made red velvet monkey bread!! Honestly, can life get better? You just made my day with this! OMG! I want this now!! Completely AWESOME! Ashton, this looks amazing… and beautiful…and delicious!!! Posting tomorrow on my Facebook page. granulated sugar or powdered sugar for frosting? Granulated sugar. I know it sounds weird, but I promise it won’t be grainy after about 5 minutes! What a genius idea! 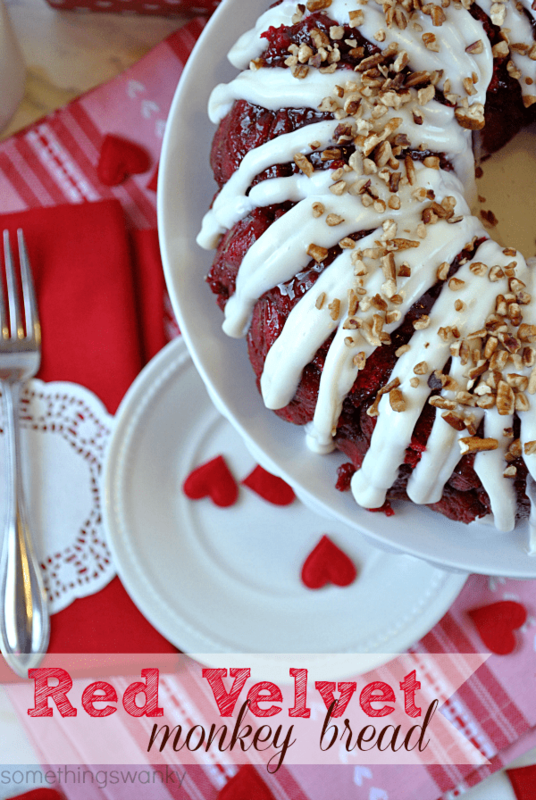 I love monkey bread and I just love that you made it red velvet!! Wow! My son will be over the moon when he tastes this on Valentine’s day! You mentioned that you put your rising dough (in bowl of course) on a heating pad… I can’t believe I’ve never done that before! What setting do you use? I’m guessing low? Just made this tonight for work in the morning. I only had an angel cake pan, but it works. I cooked it in a flat pan because I knew the sugar syrup would come out the bottom and it did. Saved myself a big mess on that one. I was afraid of over cooking it so I went to 375, but 400 would have been fine. 375 on a flat pan took longer! The guys at work will love it, but I can’t do these sugary desserts, lol. My yeast didn’t get foamy in the 2 1/2 cups of water, nor did my bread rise a lot, but it seems to be still coming out good. I had difficulty deciding it was done, but went with my baking instincts. I’ll update tomorrow how it came out if I remember! Lol.